Home » News » Is Your Child Ready for ‘How to Train Your Dragon’ 3D Movie? AURORA, Ohio, March 25 /PRNewswire-USNewswire/ — If you are planning on taking your kids to see Dreamworks’ “How to Train Your Dragon,” you need to know how to determine if they can see 3D and then prepare them for what will happen during a 3D movie if they have never seen one before. If your child has been diagnosed with Lazy Eye (Amblyopia) or an eye turn (Strabismus), they will not be able to see the full 3D effects. Most 3D movies provide visual clues, such as objects appearing smaller the further away they are, which anyone can see whether they are using both eyes or just one. However, there are special effects which do require that you use both of your eyes at the same time. If your child doesn’t have 3D vision, he won’t be able to see these special 3D effects. There are some scenes in “How to Train Your Dragon” which can make you feel as if you are on a rollercoaster ride. When a child has never seen a 3D movie before it’s best to prepare them beforehand for what they will see. If you can, draw a picture to show your child how with most movies the picture stays on the movie screen. But in this movie the picture will look as if it is filling the whole theater and they may feel like they can reach out and touch the characters. Also be sure to tell your kids ahead of time that if they don’t like what they are seeing or feel uncomfortable, they can close their eyes and you will let them know when they can open them again. During the movie keep an eye out for any signs of a headache, nausea or dizziness during or shortly afterwards. In addition, watch to see how your child responds to the special effects to see if he responds the same way as the other kids do; for example, as the hero of the story, Hiccup, flies through the air with his dragon, Toothless. If not, it’s possible that he isn’t seeing the special effects. These are signs that your child may have a vision problem and you should schedule an eye exam to have it fully checked. 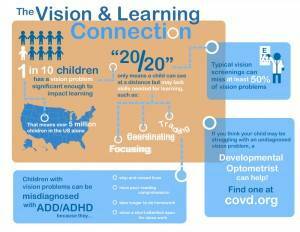 Is your child’s 3D vision draggin’? If your child has trouble with 3D vision, has any of the problems listed above or has a lazy eye or eye turn, it is possible to teach them how to see 3D. As technology quickly advances to provide us with 3D ready TVs and 3D video games, this is just the beginning. “It is our mission to educate the public on the fact that you and your children can become 3D ready. Optometric vision therapy has helped thousands of people across the world to be able to see 3D,” Habermehl states. 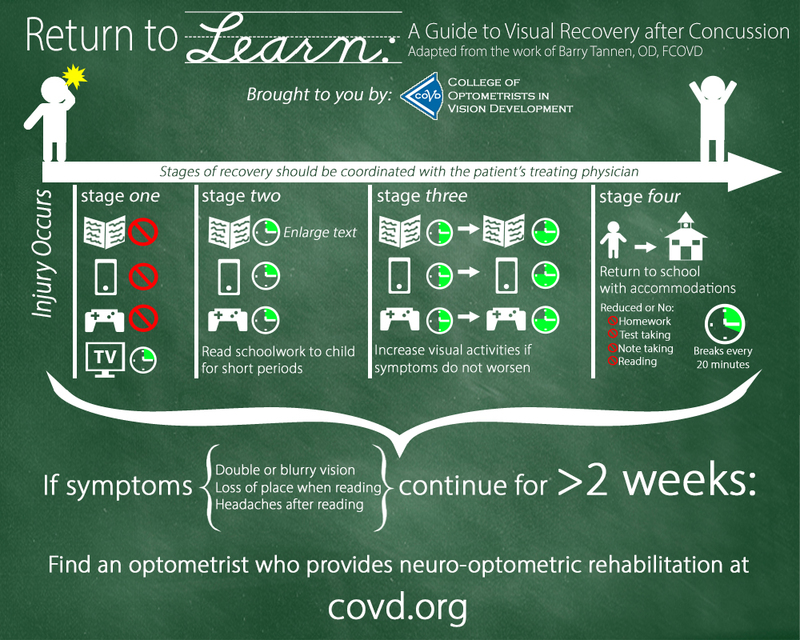 The College of Optometrists in Vision Development (COVD) is an international, non-profit optometric membership organization that provides education, evaluation and board certification programs in functional, behavioral, and developmental vision care, optometric vision therapy and vision rehabilitation. 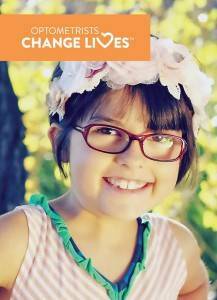 The organization is comprised of doctors of optometry, vision therapists and other vision specialists. 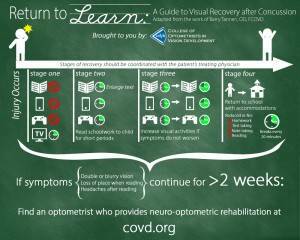 For more information on learning-related vision problems, vision therapy, COVD and our open access journal, Optometry & Vision Development, please visit www.covd.org. Developmental optometrists are eye care practitioners who specialize in visual development, the prevention of vision problems, enhancement of visual skills, the rehabilitation of various functional vision problems, and provide optometric vision therapy for children and adults. Optometric vision therapy is a program of prescribed procedures to change and improve visual performance, which in turn helps our eyes and brain work together more effectively for reading and other learning tasks as well as seeing 3D.